I am so excited to be here at U create, I feel like I’ve made it to the big times, I want to break out in song… “Start spreading the news…”! But you wouldn’t hear me anyway, right? So, moving on. Thank you so much Kari for letting me share this little project! Let me introduce myself, I am Cassity from Remodelaholic. See, while looking through my trusty catalog I saw this (below), and I loved the mosaic piece of art. So, I set my trusty little mind to figuring out a way to make this for myself, and now you can too. There you have it. An easy work of art that can be custom made to match any decor. 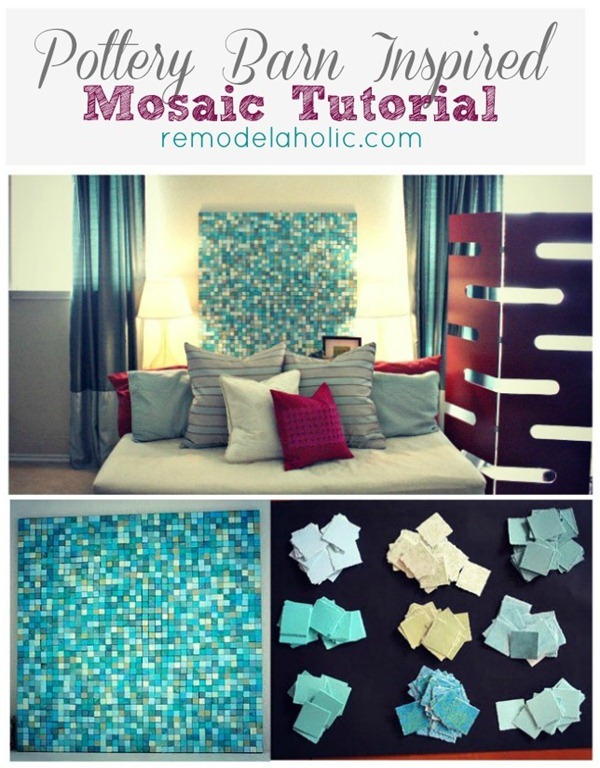 If you get the chance, please stop by Remodelaholic you will find tons of tutorials! Love it! We built a fireplace in our living room and I have been searching for something for the mantle. I didnt want tacky and I didnt want to spend a ton of money.. heading to home depot tomorrow.. thanks!!!! That’s gorgeous!! I may have to attempt that! Grat idea! I think my son would love this for his college apartment…an inexpensive and easy great look! He also enjoys “creating”! Amazing! You gotta have a lot of patience to do something like that! Thank you for taking time to be a creative guest on Ucreate!! I love this tutorial and will surely follow your blog! Great job! Very cool! I love it. What a great idea! I can’t wait to try that! That would also make an AWESOME quilt! What an awesome project! Now I need to check out those turorials… I can find all kinds of trouble! Wow! This is amazing! I’ve been looking for a new headboard but haven’t had the money. I will be trying this this weekend! This is amazing! I will definitely have to make a long skinny rectangle to fit above my bed. Thanks for all the wonderful comments! I am glad you all like the mosaic! This is awesome, I think I can do it! I shall surely spread the word! K—that took some time…all those little squares! But it looks amazing, I like it better than the Pottery barn one. Great job! oh i am SO doing that this week! THANKS! Oooh I love this! Yay, yay, yay… I can’t wait to make one! I’ll be linking as well. Oh my goodness!! That is so impressive!! I would never have the patience nor the ability to do that. It looks awesome!! INCREDIBLE!!! That’s going into my craft to-do file! Thanks for sharing! I think this would be a beautiful kitchen back-splash… I’m looking for some tiny tiles… then going to try it… thanks for the idea! I truly loved your mosiac. It turned out fabulous! 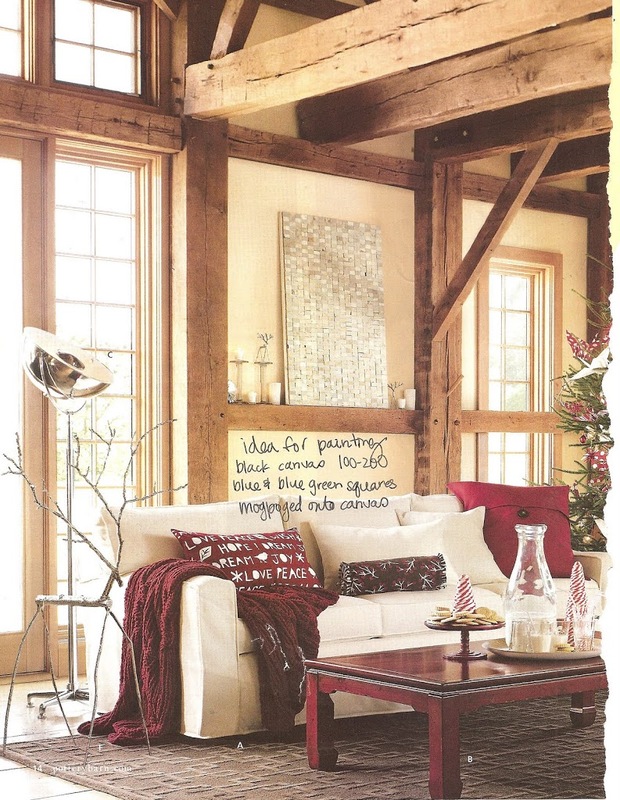 I might do this in a family room we are redoing… Thank You for spreading the News! Wow! You are good. I thought your picture was the PB example! Excellent! This is absolutely gorgeous and it looks so easy! Thank you so much for linking up to Homemaker Monday with this tutorial!! Love this!! Thanks for a fab idea! I absolutely LOVE this! I love the clean look of it. Such a great idea. Thanks for the tutorial!! What a great idea! This is SUPER cute and I really thought it was tile at first! Cassity – you’re awesome! It’s great to see her here on U create! Wow! That’s beautiful! Thanks for sharing the how-to! I’m visiting from Tip Junkie! Wowzers…that is awesome! Your take turned out beautifully, thanks for sharing! I found it!!!!! This is what is going over my fireplace. You rock! I am SO at home depot tonight! Whoa, love this!! I always loved mosaic but was afraid to do it with tiles ‘coz of the heavy work..but this sure is fun!! Wonderful idea! I am so going to have to try this! you got my wheels turning! It’s just SO GORGEOUS! I wonder if I cna’t take this idea for a backsplash! Hmmm!! Maybe with a few coats of very thick varnish!! Love this. Not sure if I have the patience to cut all these! WOW! This is beautiful! I love the colors you used! Awesome job! I love it. I did something like this, but with paint chips from Lowes. It turned out great. Thanks for joining Get Your Craft on Thurs. Please come by next week for another great party. Holy cow, that is gorgeous! I thought it was glass tile! That is incredible–the blues are beautiful. Thanks so much for linking up! 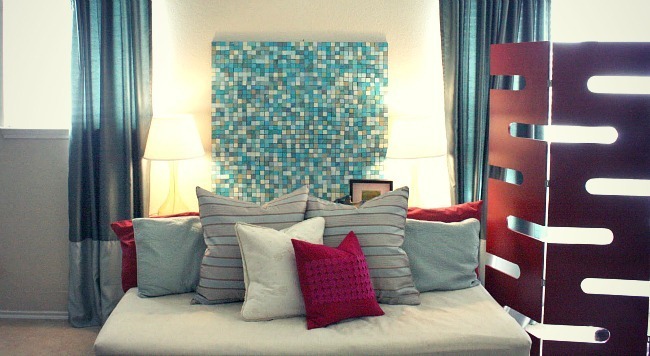 This is a cool idea… I actually do “real” mosaic tile art (meaning, with glass/ceramic tiles!) and have one similar to yours hanging in my bedroom – a lot more time intensive and messy, but can be beautiful and substantial. If you ever want to post a tutorial on how to do the real thing, I’d love to do one for your blog! I love mosaic art! Good job! This is wonderful – I’m very inspired to give it a try. Thank you for the tips. Now that’s using the “little gray cells”. Great job! That looks adorable, nice project! i counted your squares and i think i came up with more than 36 from top to bottom … so did i count wrong or are your squares or board a different size than you mentioned. it looks really prett … but i have to stress over the details! This is just outrageously beautiful! Great job! My word. I cannot believe that is made out of paper! It seriously looks like tile. How gorgeous. I may have to try that technique on something. All of those teeny little squares will be the end of me, though. Wow – that is an awesome project! Just amazing!!! Thanks so much for linking up to my party! I really appreciate it! Note to self: Replace the artwork behind the couch ASAP! Great project! Thank you for sharing this! This is so brilliant. I am starting it on Monday. Thank you! I love mosaics and sea glass and this looks like the most perfect marriage of the two. So great! I’m going to buy supplies tomorrow. What type of wood did you use and how did you mount it? Plywood? what an awesome idea!!! 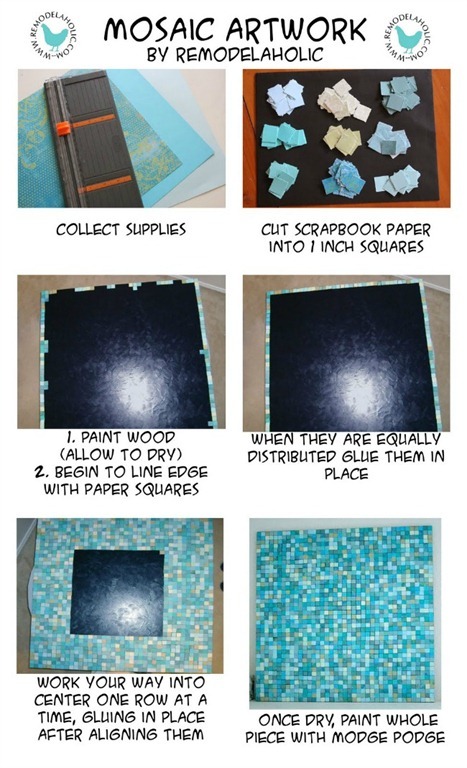 Thank you so much for sharing this…at first glance I thought it was made from glass tiles….I am sooo inspired to try one of these!!!! !